As we all know that Apple has released its latest iOS 12 Firmware for iPhone, iPad, and iPod touch devices at this year's Worldwide Developer Conference (WWDC) 2018 officially. Just like past practices, currently Apple has limit and restrict the availability of iOS 12.3 update to iOS developers only, hence if you are a non-developer or general public user, then you will need to wait for some weeks to get install iOS 12.3 Update officially through Apple Developer Program by using Over-the-Air (OTA) or via iTunes methods. But we have got the solution for all iOS non-developers and general public users who want to experience the all-new iOS 12.3 Firmware before its public released. 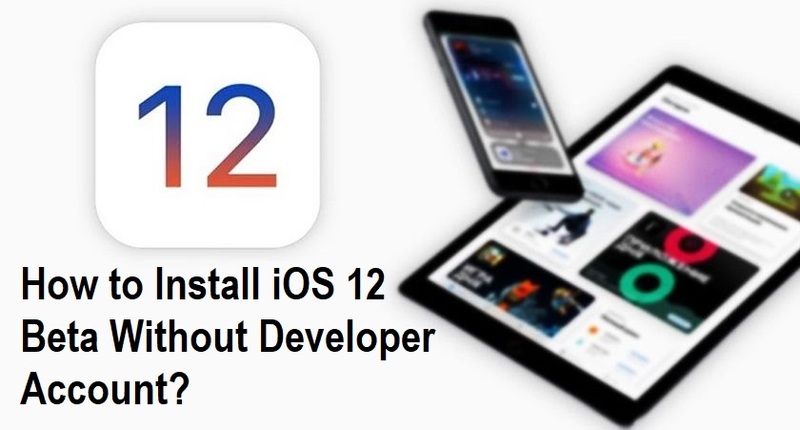 In this post, we are sharing the working guide and tutorial on How to Free Download and Install iOS 12.3 Beta Without Developer Account and Apple UDID Activation on iPhone, iPad, and iPod touch devices. Following method is also applicable to tvOS 12.3 Beta for Apple TV devices and watchOS 5.2.1 Beta for Apple Watch devices. There are two methods through which users can Free Install iOS 12.3 Beta Without Developer Account and UDID Activation. The first method needs your computer or laptop having iTunes software installed, and the second method only needs your iPhone, iPad, or iPod touch device. For the first method, you will also need to have the relevant iOS 12.3 Beta .IPSW Files, which we are also sharing in this post, while the second method requires iOS 12.3 Beta OTA Profiles, which you can also get in this post. So let's get started the step-by-step guides below. Disable all kinds of security codes and Find My iPhone settings on your device. SIM card activated iPhone, iPad or iPod touch device. On iTunes 12, ensure to click on Update Button, rather than Restore Button. Make sure to back up full data of your device. How to Install iOS 12.3 Beta Without Developer Account and UDID Activation using iTunes for Free? Step # 1: Download the latest iOS 12.3 Beta .IPSW files via direct links provided above. Step # 2: Download and install the latest iTunes 12 software via direct links provided above. Step # 3: Plug your iOS-powered device into your PC or laptop and open iTunes 12. Step # 4: Get full Backup of your device data before updating iOS 12.3 Beta. Step # 5: Select your respective iOS device from the iTunes menu. Step # 6: Now hold down Shift (on Windows) or Alt/Option (on Mac) key, and simultaneously click on "Update" button. Here you will be asked to provide the iOSBeta.ipsw file. Select the relevant iOS 12.3 Beta version which you had downloaded earlier. Step # 7: Your iOS device will now begin to update to iOS 12.1 Beta Firmware. How to Install iOS 12.3 Beta Without Computer and iTunes for Free? Step # 1: Open Safari web browser on your iOS device, and navigate to the above iOS 12.3 Beta Download Links. Step # 2: Download the latest iOS 12.3 Beta OTA Profile available for your device. Step # 3: Open the downloaded OTA profile on your device and you will be asked to install the "iOS Beta Software Profile". Press "Install" button three times to install the Over-the-Air Profile, and then restart your iOS device to ensure the profile is installed. Step # 4: Once your iPhone, iPad, or iPod touch device has rebooted, go to the Settings app and navigate to General >> Software Update option. Here you should find the latest iOS 12.3 Beta Update ready. Step # 5: Click "Download & Install" button. Now iOS 12.3 Beta will begin to download and install for free.